Co-authored with Christopher James Whitson. Yogavotes, a national, nonpartisan campaign has petitioned an estimated 20 million American yoga practitioners to vote in 2012. Yogavotes claims that “yoga is voting,” which is a lie. Yoga was never intended to be political and should never become political. Yogavotes, or any political non-profit acting in the name of yoga is inherently unethical according to yoga’s clearly defined universal purpose. For the record, we are libertarians and we respect your right to vote your conscience. Not all yoga teachers share this value and there is a growing trend where yoga teachers are endorsing candidates in their classes. While this tactic is not supported by Yogavotes, some of their ambassadors are publicly endorsing their chosen candidates. There is nothing unethical about encouraging someone to vote or to vote for a particular candidate. But doing it in the name of yoga is a form of cultural genocide. It implies that yoga is something very different from what it is or was ever intended to be. Telling someone to vote a certain way assumes that you know what is right. But what if you are wrong? Even if ONE person is hurt by those policies then what you have done can not be classified as karma yoga or seva because seva helps EVERYONE. In such a situation any action establishes further karma. With all the hype about yogis “needing” to vote, is it any small wonder that the Yogavotes movement is being driven by propaganda? 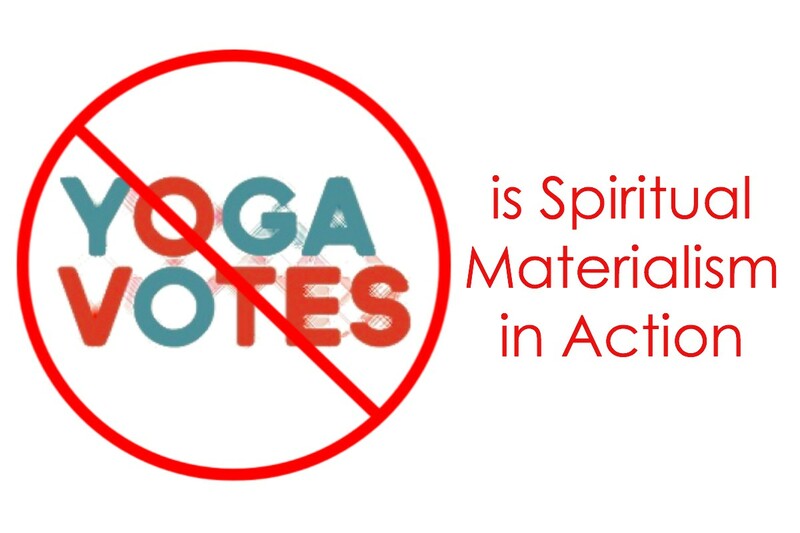 Yogavotes is attempting to change the stereotypical view of yogis as being “fluffy, spiritual people.” Yogavotes claims that certain yogic values of awareness, connection and participation are integral to the voting process. Yet they fail to offer a balanced perspective of the valid arguments that have been made against voting. Despite Yogavotes’ claim of being non-partisan, they are appealing to a demographic that is predominantly comprised of Democrats. Since the 1960’s yoga has been branded a progressive or liberal practice in America, despite the many thousand year history of Sanatana dharma and the various schools of Indian philosophy (of which Yoga is only one). This is mostly due to the conservative slant toward Abrahammic religion and Christianity in particular. Many conservatives (though admittedly not all) view yoga as being outside of Vatican-approved practices and at worst from the devil. Some may argue that hippies did significant work to popularize yoga in the West, thus implying that is a good thing. We disagree with the notion of this being a “good” thing. Some argue that the popularity of yoga exposes more people to it. This is faulty and inaccurate logic. What is commonly accepted and believed to be yoga is not yoga at all and never will be yoga. Yoga, by its very definition, is “union” and “yoking.” Yoga can be illustrated by its single-minded aspiration and unifying purpose of Moksha (liberation) through Nirvikalpa Samadhi – the absolute ascension of one’s own intimate energy and consciousness. This and this alone is Yoga! What does Yogavotes or voting have to do with Moksha? The idea of saving the world through a non-profit somehow continues to have a lot of curb appeal and non-profits pop up all the time. But despite the increasing numbers of non-profits the state of the world has become progressively worse. Yoga was never intended to be political. If anything, it was intended as an escape from politics (if you define politics as karma). While the modern sage Aurobindo was politically active for much of his life, he had to give up his activity in politics in order to devote himself to spiritual pursuits. Aurobindo believed that for human society to reach its full potential and become enlightened, each individual had to undergo internal enlightenment: the unification of kundalini with the supermind. Yogavotes is appropriating the power and authority of the word yoga for an aim that is not in any way a Yogic aspiration. The more people believe something the more that becomes their reality. If Yogavotes continues to influence people’s beliefs yoga will become nothing more than a political-social-marketing platform and an alternative to the bar scene. Yogavotes is spiritual materialism (a phrase coined by Chogyam Trungpa Rinpoche) in action. Not because it uses spirituality to sell something – it’s spiritual materialism because the ego is putting on a spirituality “suit” and is tricking you into thinking you are being spiritual by voting. And this ego-charade has infiltrated every aspect of the yoga community. What is needed in the world today are more people who are willing to challenge their own egos, rather than making themselves look and feel good at the expense of true liberation (Moksha) and truth (Satya). Yoga is intended to be completely non-partisan. How can ascension and liberation be partisan? Please, don’t put yet another stain on Yoga by condoning this Yoga Lobby. Fantastic! A voice of reason, (much lacking in the current yoga pop trend). Kudos.